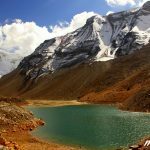 Kedar Tal is an emerald lake resting next to Kedar Bamak Glacier at the foot of lofty Thalaysagar (6,904) and Brigupanth Peak (6,772mts). 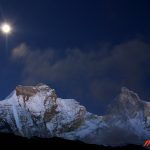 Kedar Bamak Glacier is the source of Kedar Ganga which acts as an important tributary of Bhagirathi River. 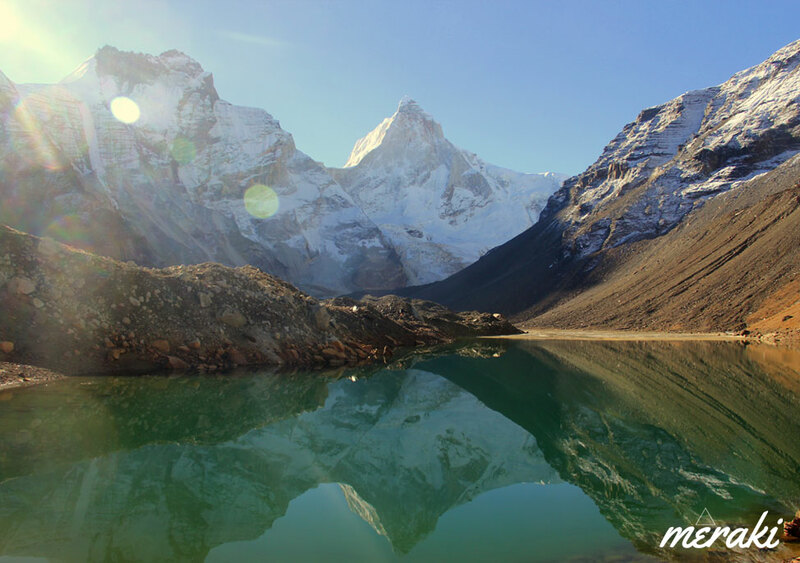 At 4780mts above sea level, Kedartal is a picture perfect high altitude lake. 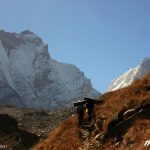 Please note that this trek requires previous trekking experience in the mountains or good physical fitness and mental strength. 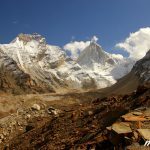 The holy town of Gangotri is the base camp for the trek to Kedartal. This trekking route is open from May to October but avoid visiting this region during monsoon. Gangotri National Park remains closed during winters as it is prone to heavy snowfall. 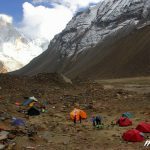 Camp in front of the pristine Kedar Tal. 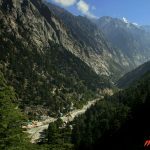 Uttarkashi is one of the major towns of Uttarakhand thus buses and shared cabs are easily available from Dehradun & Rishikesh. The massive Tehri Dam Lake also comes into view as you proceed towards Chilyanisaur. After a short break at Uttarkashi continue another 3 hours drive to reach Harsil. Cross the bridge over Bhagirathi River and start the climb on the right side. First few kilometres of the trek are very steep so try to walk with a slow yet constant speed. The trail initially passes through pine trees then enters a mix vegetation zone o f fir and bhoj trees. 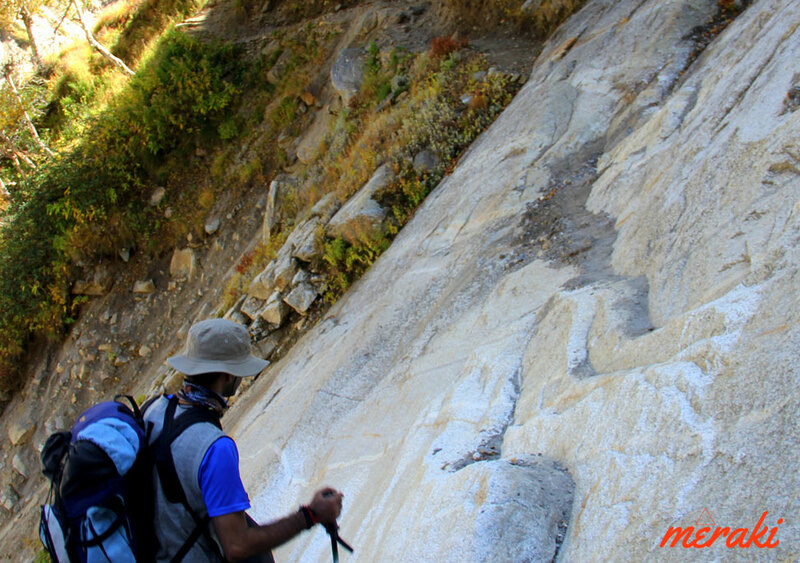 During this trekking stretch you’ll see Kedar Ganga flowing on your left, deep down in the gorge. The sound of the furious river and the whispering sound of trees are a treat to ears. 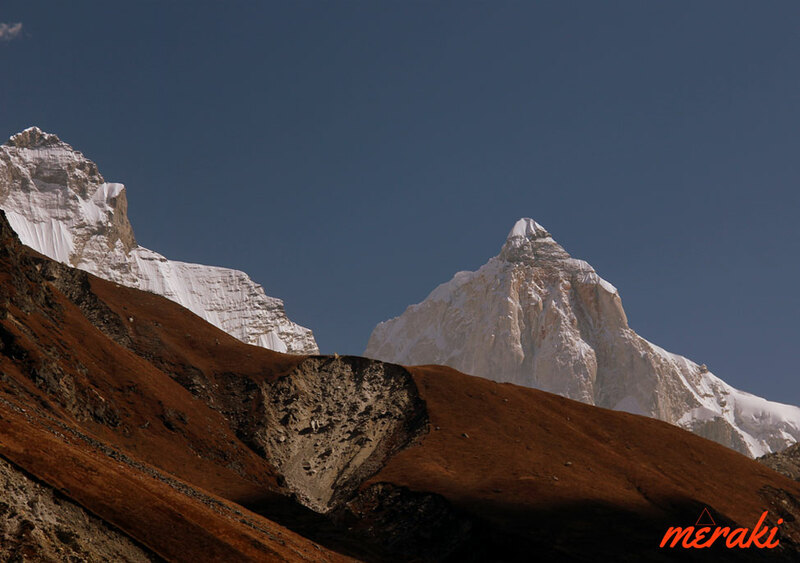 Soon you’ll witness the first view of Thalaysagar and every step will take you closer to this stunning mountain. 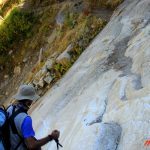 Just before reaching Bhoj Kharak there is a slant rock amidst the trail with space of just a few steps, it has been named Spider Wall by few bloggers. 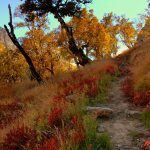 But while it may seem daunting in the pictures, it is not that difficult to traverse this section in the absence of snow. During early June or late October if the rocky face is covered with snow then it will require some skills to cross this section because one slip can drag you to few hundred feets below. Crossing this section will lead you to Bhoj Kharak. 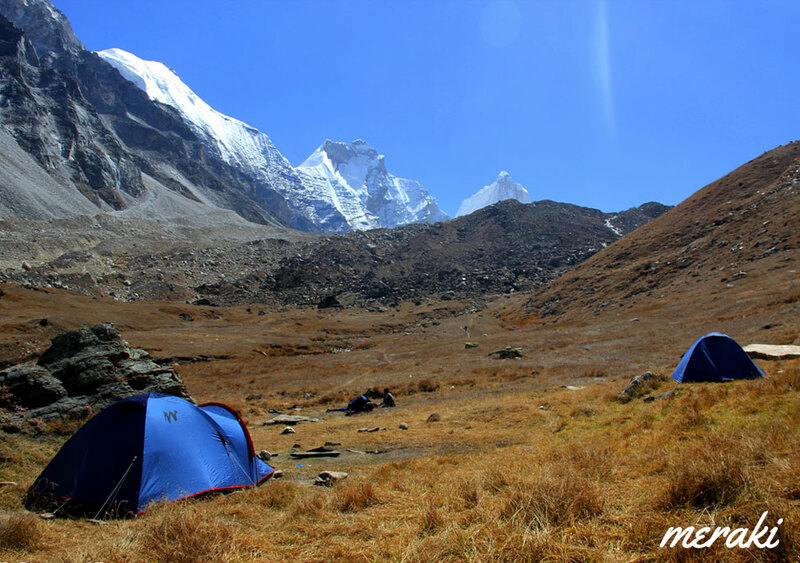 Situated at the elevation of 3,780mts above sea level Bhoj Kharak is a small and an average looking campsite. If you are fit and managed to reach Bhoj Kharak at around noon, then keep it an option to reach Lower Kedar Kharak on the same day. 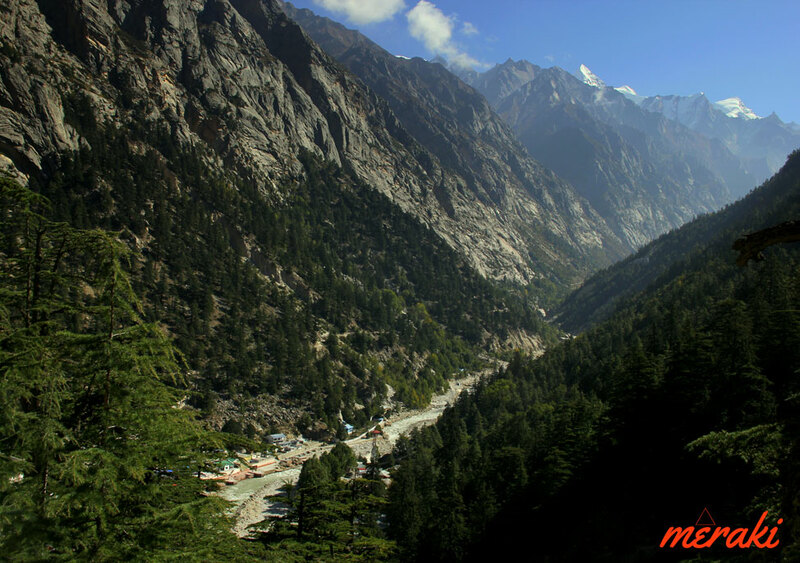 This 5kms stretch passes through some patches of complicated rugged terrains. After every half an hour into the trek you’ll see a pleasant change in the scenery. 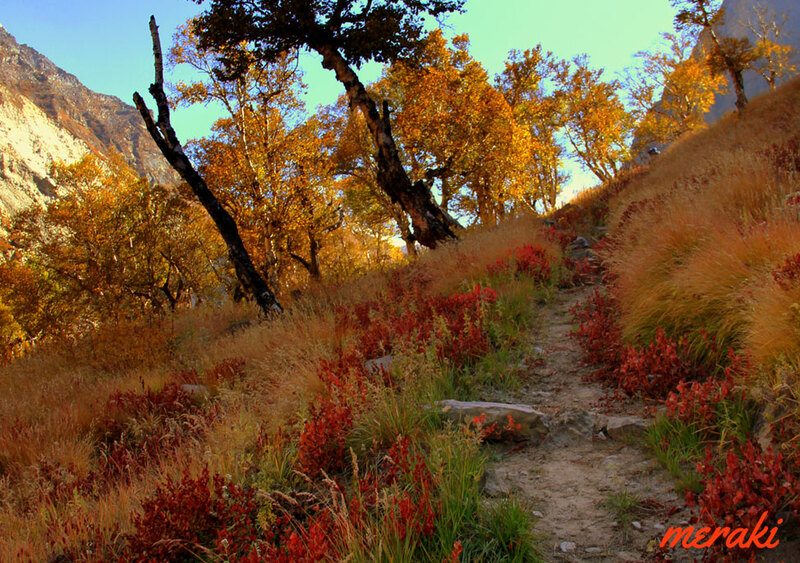 Initially it starts with a flora rich trail with numerous Bhojpatra trees and colourful wild bushes around. Soon the view changes with Manda peaks revealing itself. 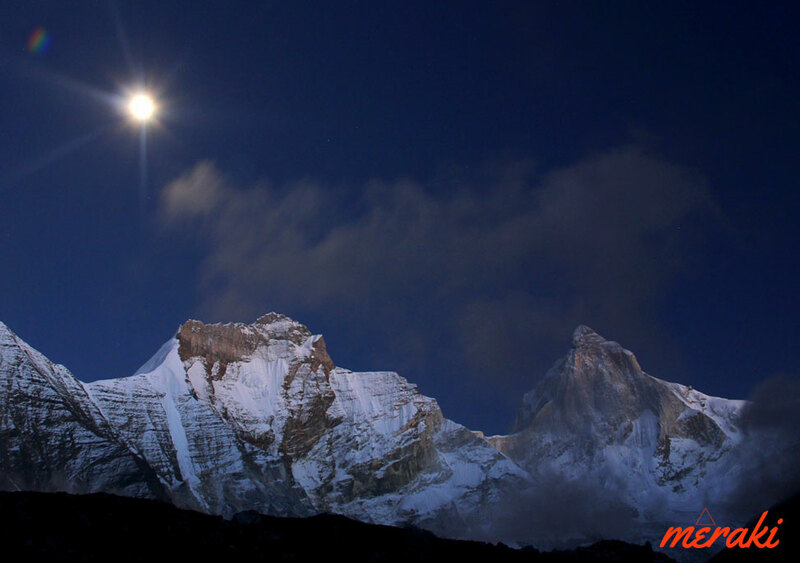 Stunning views of Bhrigupanth peak will also catch up as you trek nearer to Kedar Kharak. Concentrate on every step while you cross the landsliding zone of Gila Pahar. If this section of Gila Pahar is in very bad shape then try and trek down all the way to Kedar Ganga, cross the river and hike against the river flow until you cross the Gila Pahar intersection then cross the river again and hike back to the original trail that leads to Kedar Kharak. 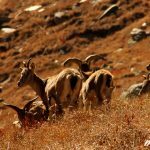 A wide valley opens up as you proceed towards Lower Kedar Kharak (4100mts) and the trekends up at the beautiful meadow of Kedar Kharak situated at an elevation of 4,280mts above sea level. 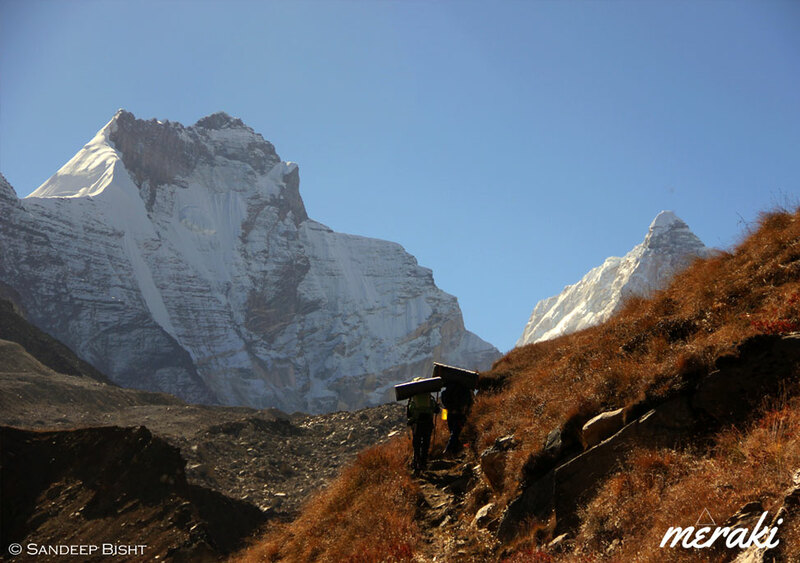 Even though this trekking stretch is just 5kms long, it demands good physical strength and endurance from trekkers. 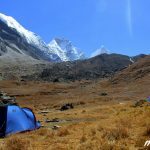 But in the end it is a well paid off effort because Kedar Kharak is one of the most beautiful campsites in the Gangotri National Park region. 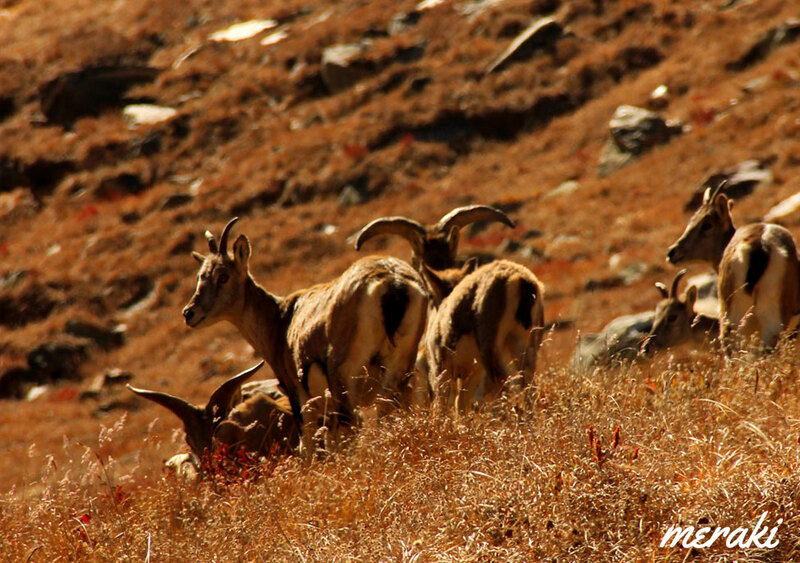 Also, Bharal (Blue Sheep) often visit here for grazing, making it a picture perfect location for photographers. The sight of Bhrigupanth and Thalaysagar peaks standing high together is like a surreal dream. 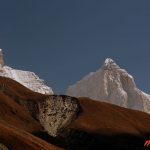 It takes another 5kms to reach KedarTal from Kedar Kharak and most of the route is on moraines and glacier covered with moraines. If trekking in June you might have to trek on snow for last couple of kilometres before Kedartal. Cross the brook carrying icy cold water and climb the steep rocky terrain. Keep following the cairn markings to ensure that you are on the right trail. After climbing the final ridge, Kedar Bamak Glacier comes in the view along with its glacial lakes. The foot of Mt. Bhrigupanth and Mt. Thalaysagar merges with the Kedar Bamak Glacier. 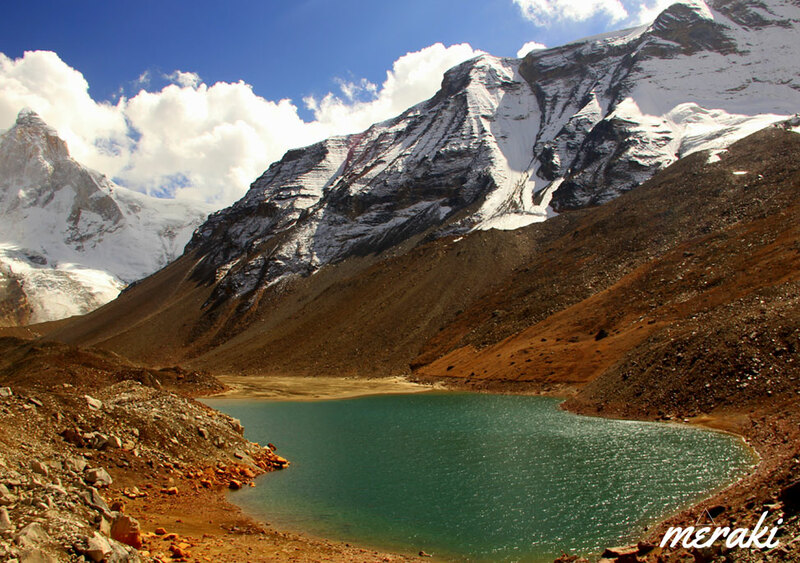 An hour further into the trek reveals a beautiful high altitude lake, the immaculate Kedar Tal. The view ofThalaysagar peak reflectingon thestill water of Kedartal is mesmerizing. Kedar Tal is situated at an altitude of 4780mts above sea level. 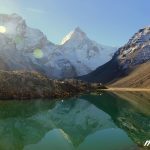 AMS is quite common at such altitude so it is better to go for an acclimatization hike. 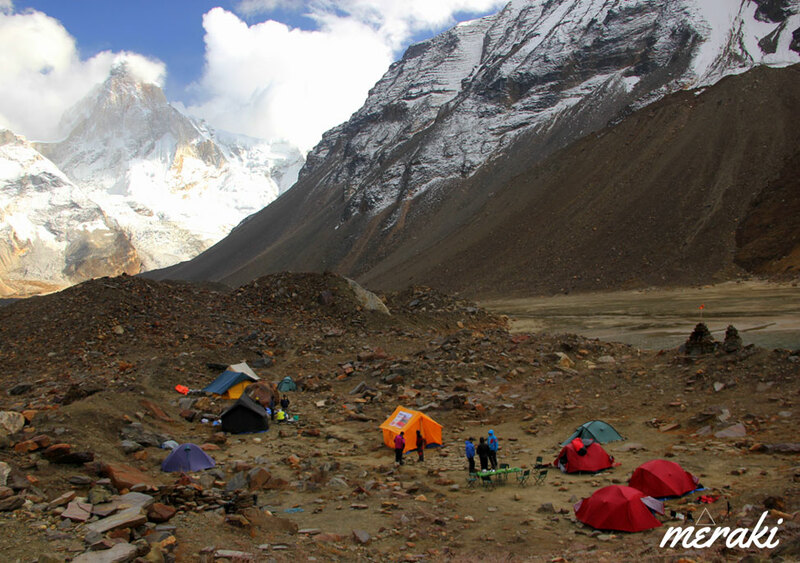 Exploring Jogin Advance Base Camp is the best possible option. 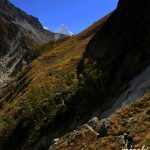 Leave from Kedartal at around noon and trek towards Jogin ABC (4900mts). This hiking stretch will not only get you well acclimatized but it will also showcase the best views of Thalaysagar peak, its West Ridge will open up and you’ll see the Thalaysagar Ice fall from near. Also Jogin group of peaks will reveal itself. Trek back to Kedar Tal. Overnight in tents. Wake up early in the morning for a glorious sunrise and absorb as much beauty as you can. 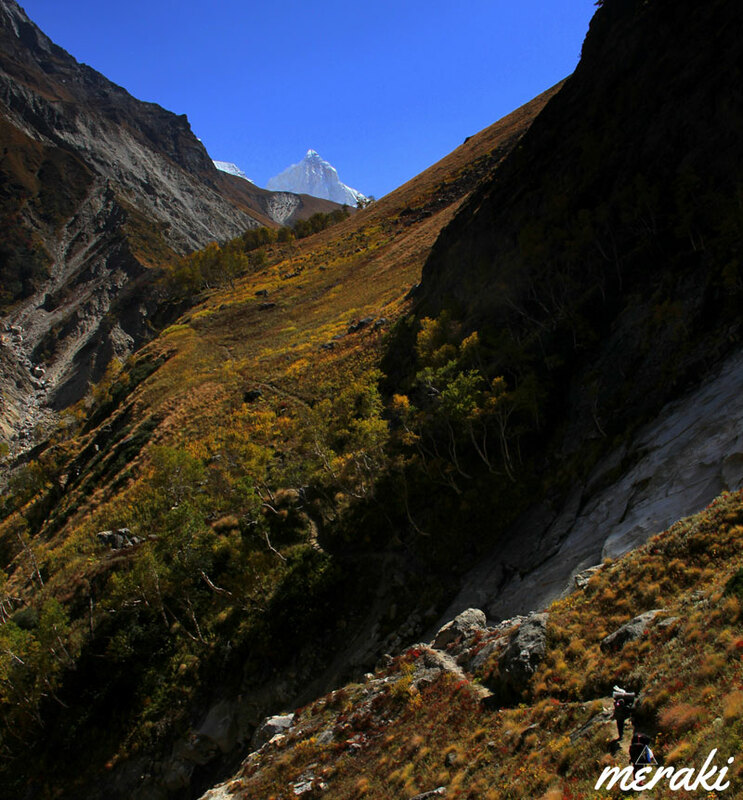 It is one long and tiring hike back to Gangotri this day which takes around 7-8hrs to complete. 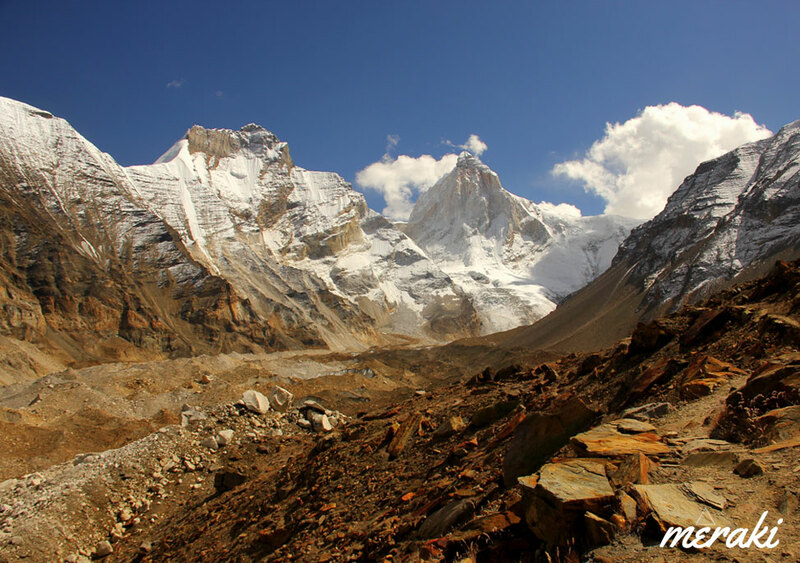 If you manage to reach Bhoj Kharak by 3pm then proceed towards Gangotri, else camp at Bhoj Kharak.